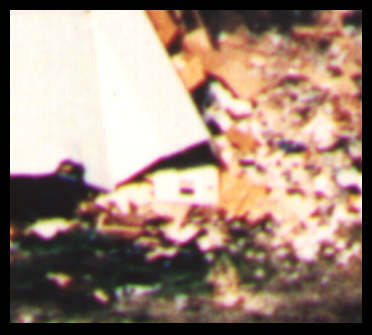 A forward-looking infrared (FLIR) video camera mounted on an aircraft circling over the Mount Carmel Center in Waco, Texas, on April 19, 1993 recorded large thermal flashes in the debris of the demolished Center moments before the fire broke out. FLIR analysts presented on the documentary Waco: The Rules of Engagement say these flashes are from a "pyrotechnic explosion" and "are most likely detonations inside the building." The documentary purports that these "detonations" are an origin of the fire. However, careful analysis reveals that the flashes occur in a window frame lying on the ground, and thus the flashes in the window are not inside the Center. Here we see a Location-3 FLIR flash, which appears within the frame of a window that was at the end of a catwalk fallen to the ground after a tank demolished the structure. The wall with the window in which the flashes occur is lying on the ground. The next image is from a visible-light photograph taken a few minutes after those FLIR frames. 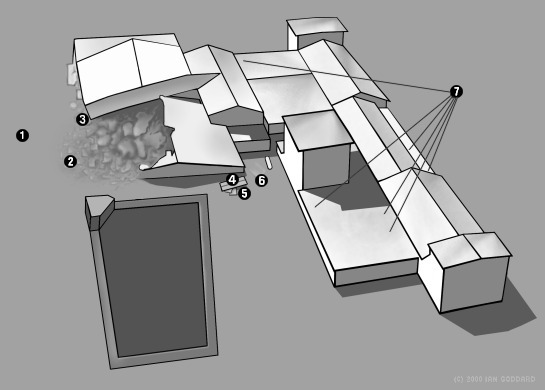 In the center of it is the same wall with window at the end of the fallen catwalk in which the Location-3 flashes occur. Observe that the catwalk wall with the window in the center of the photo is lying on the ground facing the sky. From the same negative as the cover of The Davidian Massacre. The only things you could see through that window from above would be things on the ground underneath the window, not things inside Mt Carmel as suggested in Waco: The Rules of Engagement. When I met Davidian attorney James Brannon, I had opportunity to briefly browse through the full Vector Data Systems report. In the report I saw a close-up photo of the same window above, and glass was still in it. While watching the FLIR you can see the sun's reflection "walking across" the different glass panels in the window frame, as seen in the following clip of the Location-3 FLIR flashes. Observe that each discrete flash originates from and is centered around a discrete location within the window frame, which indicates that each flash is a specular solar reflection on a separate panel of glass within the window frame caused as the aircraft moves quickly left to right through beams of solar energy reflected off those panels. At one point midway through the flash event I believe you can actually detect the thin molding between two separate glass panels in the window frame as a separation between two smaller flashes. Consistent with appearances, the Vector Data Systems report concludes that the flash event at Location 3 is are passive specular solar reflections (PSSRs) on debris (see event 50). The flash event at Location 3 cannot be a pyrotechnic detonation inside the building seen through the window because the window within which the flash event occurs is lying on the ground facing the sky. If the flash event was explosives, the explosives had to be located either under or on top of the fallen window. However, because there is (a) no apparent damage to or displacement of materials at Location 3 resulting from the flash event, (b) no lingering thermal signature as one might expect to result from explosions transfering intense heat to surrounding objects, and (c) no person seen placing anything at Location 3 nor hot-exhaust trail of a fired pyrotechnic projectile streaking toward Location 3, there are no reasons to believe Location-3 flashes are explosions other than that they are bright flashes. Since other things like specular solar reflections can cause flashes on FLIR, the mere existence of flashes on FLIR is not sufficient to sustain the detonation claim. On the other hand, because (a) the window is lying on the ground facing the sun, (b) there are glass panels in the window, and (c) glass can reflect infrared solar energy producing bright flashes on FLIR, all the necessary criteria for the existence of specular solar reflections are satisfied while not all the criteria previously cited for the existence of explosives are satisfied. Conclusion: for the many reasons covered here in, it is manifestly apparent to this author that the flashes at Location 3 are not merely reflections of the infrared energy of the sun, but, with glass known to be in the window facing the sun at Location 3, are clear empirical examples of specular solar reflections detected by the Waco FLIR.